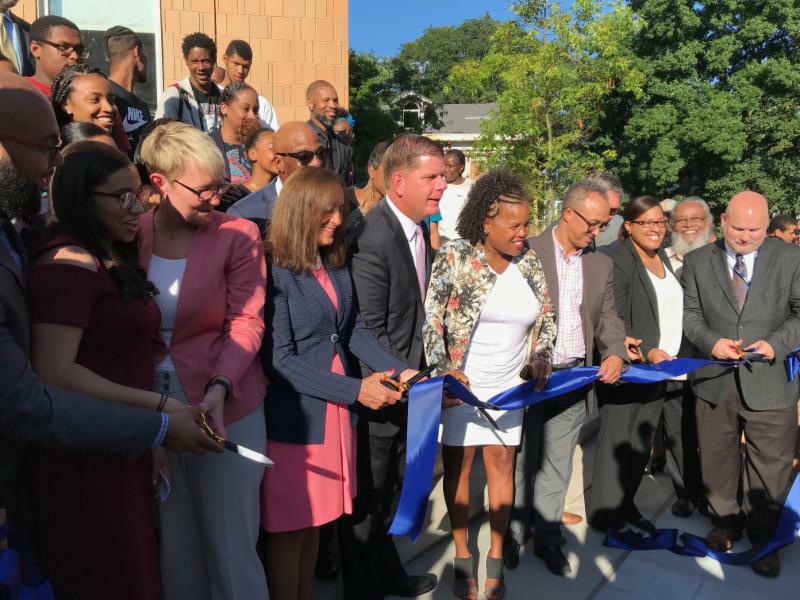 BOSTON — Thursday, August 23, 2018 — Today, Mayor Martin J. Walsh and the Boston Public Schools (BPS) celebrated the opening of the Dearborn STEM 6-12 Early College Academy, the first school in Boston intentionally designed and built for STEM (Science, Technology, Engineering, and Math) learning. This state-of-the-art,128,000-square-foot facility, located just outside of Dudley Square in Roxbury, features flexible indoor and outdoor learning spaces; two fabrication labs (also known as “fab labs”); numerous modern technology, including 3D printers and laser die cutters; a gymnasium; a dance studio; a media center; an abundance of natural light with views of the downtown Boston skyline from several classrooms; sophisticated green energy systems; and much more. The building was designed by the firm Jonathan Levi Architects of Boston and built by Gilbane, Inc. in partnership with Janey Construction Management. The design and construction of the project was managed by the City of Boston Public Facilities Department in collaboration with Daedalus Project Managers. The Dearborn STEM Academy was built to serve 600 BPS students by 2020. Currently, 488 students are enrolled as the school begins to expand. Currently operated by Boston Plan for Excellence (BPE), a nonprofit educational organization focused on schools in the Dudley Square neighborhood, the Dearborn STEM Academy is designed to bridge rigorous academics and career readiness, while leveraging Boston’s unique wealth of higher education and industry opportunities. Francilliana Barbosa of Dorchester, an eleventh-grade student this year, spoke during the ceremony about the many opportunities she was provided as a student at Dearborn STEM, including her experience building her own toiletry organizer business through the BUILD entrepreneurship program, and an internship at Massachusetts General Hospital. The design of the new school is based upon the project-based learning curriculum. The academic spaces are organized by cohort, which includes educational classrooms, science laboratories, special education instructional space, and shared amenities. Joshua Fidalgo, a Roxbury native who works as dean of students at the Dearborn, said the new building represents promise for his students. The $73 million facility was the first new school construction project in the Boston Public Schools in 15 years, and is seen as a model for future projects through the BuildBPS educational and facilities master plan. About $37 million of the total cost was reimbursed by the Massachusetts School Building Authority (MSBA). Since 2014, Mayor Walsh and BPS have secured more than $110 million in MSBA funds to support new school buildings and facility renovations, which includes $30 million from the MSBA Accelerated Repair Program to fund for new boilers, windows, and roofs in school buildings across the City. The MSBA is the authority set up by the Commonwealth to help finance public school capital projects. However, despite Boston being the leading source of the sales taxes that fund the MSBA, and having the state's largest school district, Boston never drew in a significant way on MSBA funding before the Dearborn STEM Academy project began. The school is the result of an ongoing public-private partnership, with continued support from the Greater Boston Interfaith Organization, Roxbury Presbyterian Church, Dudley Street Neighborhood Initiative, and a number of philanthropic and nonprofit partners. Located at 36 Winthrop Street in Roxbury, the new Dearborn STEM Academy is at the same location of the Henry Dearborn School, which was built in 1913 when it opened as the High School of Practical Arts. At the time, the school taught classes in cooking, laundry, sewing, nursing, and home economics for young women. The school was closed and re-opened in 1954 as Girls’ High School. It operated as Roxbury High School from 1974-1981; and it was designated the Henry Dearborn School in 1981. Since 2014, Dearborn STEM Academy has operated in a shared space with the Jeremiah E. Burke High School in Dorchester while the current building was under construction.